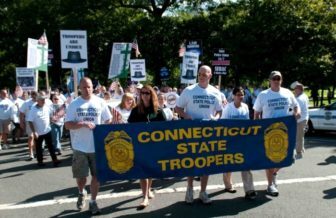 State police union members rally at the State Capitol in August 2011, the last time Gov. Dannel P. Malloy sought concessions from state employee unions. While unionized state employees have begun voting on a major concessions package, nearly 1,000 state police troopers aren’t casting ballots on the biggest cost-saver in that plan — a three-year wage freeze. While the 990-member Connecticut State Police Union will be voting on whether to accept health care and retirement benefit concessions, union leadership declined to reopen an existing contract governing wages that grants them a pay hike this fiscal year. That also means troopers would not receive the four-year exemption from layoffs that the other 34 bargaining units within the state’s workforce stand to receive if they grant wage-related concessions. The union president, Andrew Matthews, said troopers have sacrificed and continue to do so. But they also play a unique role in state government. Matthews is urging troopers to approve benefits-related concessions. “We understand that accepting these tolerable pension and healthcare concessions far outweigh the long term harm that will affect our union’s ability to negotiate our future collective bargaining agreements and enhance your future wages,” he wrote in a memo to union members. Some legislators have argued, though, that passage of the wage-related concessions also is key to stave off other lawmakers who want to change laws governing collective bargaining. With state finances facing huge projected deficits, $2.3 billion this fiscal year and $2.8 billion in 2018-19, Gov. Dannel P. Malloy is counting on concessions to help close a major part of those potential shortfalls. Malloy and leaders of most unions reached a temporary framework earlier this spring estimated to save $700.9 million this fiscal year and $868.86 million in 2018-19. The single-largest component of those savings targets involves wage-related givebacks. The governor asked unions — most of which have been working under contracts that expired June 30, 2016 — to forfeit any retroactive pay hike to cover the past 12 months, to accept further pay freezes this fiscal year and next, and to take three furlough days. This would provide 48 percent of the concessions savings anticipated for this fiscal year and 54 percent in 2018-19. But the state police union has been on a different track from other unions since 2011 — the last time unionized employees voted on concessions requested by Malloy. Troopers voted on wage concessions at that time, but rejected them. Their last wage contract, unlike those of the other unions, hasn’t expired. A general 3 percent wage hike in July 2015. Troopers not at the top experience level also were eligible for step increases. A 2 percent general wage hike in July 2016 and a 1 percent increase in January 2017, and step increases for eligible staff. And a 2 percent general wage hike in July 2017 and a 1 percent increase in January 2018 and step increases. “All we’re asking for is to have our contract honored,” Matthews said. The Malloy administration asked troopers this spring to reopen that contract and to accept the same wage concessions the other unions are voting on now. The troopers’ union leadership declined to reopen that deal. So while other unions are voting on whether to accept specific wage concessions, troopers technically are casting a ballot on whether to overrule the recommendations of their own union leadership and reopen their existing contract. Even were the troopers to do that, this would not mean they would automatically face a three-year wage freeze and furlough days. It only would mean their leadership would enter negotiations with the Malloy administration and begin discussing potential wage givebacks. There is another difference between troopers and other state employees. While workers in several unions benefit considerably from longevity pay — a perk eliminated for new hires by the 2011 concessions deal but grandfathered into place for existing workers — troopers receive significantly smaller payments. Troopers union contracts have placed more emphasis on securing traditional wage and step increases. The governor’s office declined to comment Thursday when asked about how this could affect how workers in the other unions cast ballots. The concessions ratification process is complicated and follows several different tracks. The 34 bargaining units casting ballots on the wage concessions each will decide separately whether to accept or reject those givebacks. Those bargaining units all fall within 15 larger unions, which will vote collectively on health care, pension and other retirement benefits concessions. Those are deemed ratified if unions representing at least two-thirds of the roughly 42,000-member unionized state workforce approve them. If they are ratified, they would apply to all unions, including the state police troopers. The troopers’ union isn’t the only one to have begun voting on concessions. The the University of Connecticut chapter of the American Association of University Professors and SEIU Healthcare 1199 New England, the state’s largest healthcare workers’ union, also have begun. Other unions, including the largest — Council 4 of the American Federation of State, County and Municipal Employees — are scheduled to begin voting next week.